Upwords (also branded as Scrabble Upwords in the United States and Canada, and Topwords Crucimaster, Betutorony, Palabras Arriba, Stapelwoord in other countries) is a board game invented by Elliot Rudell and originally published by the Milton Bradley Company, now a division of Hasbro. The game remains under license to Hasbro by Rudell Design, LLC. Upwords is similar to Scrabble, or Words With Friends, in that players build words using letter tiles on a gridded gameboard. The notable point of difference is that in Upwords letters can be stacked on top of other letters already on the gameboard to create new words. The higher the stack of letters, the more points are scored. This typically makes words built in later turns of the game more valuable than earlier words, increasing play intensity and adding a level of strategy unique to Upwords. The memorization of two-letter words is considered a useful skill in this game. Unlike Scrabble, which is manufactured in the U.S. and Canada by Hasbro, and elsewhere in the world by Mattel, Upwords is solely controlled by Hasbro worldwide. The game is available in about twenty languages, and there have been national tournaments played in Hungary and Turkey. There is currently an Upwords online tournament league. Players draw letter tiles until they each have seven tiles. The first player forms a word with the tiles that covers one or more of the central squares and then draws more tiles to replace those played. Play continues to the left. 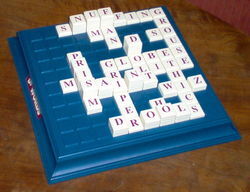 Subsequent players may put tiles on the board adjacent to and on top of the tiles already played, as long as all words formed are found in the dictionary being used. For example, if the word CATER is on the board, a player could put a B and E in front of CATER and then put an L on top of the C and a D on top of the R to build BELATED. Players score one point for every tile in their word, and for each tile under their word. If the word is entirely on the first board layer, they instead score two points per letter. When a word is constructed that contains stacked tiles (up to a total of 5 high), point values will increase. This can lead to increased scoring towards the end of the game. Players are not allowed to pluralize existing words by simply adding an "s" on the end of a word. If a word is pluralized by the addition of an "s", the "s" must also be part of another complete word that was placed on the board. This rule prevents players from capitalizing too much on other players' words without changing them. Originally, Upwords was played on an 8 by 8 square board, with 64 letter tiles. Hasbro Europe later expanded the gameboard to a 10 by 10 matrix and 100 tiles, to accommodate the longer words frequently used in foreign languages such as German and Dutch. The 10 by 10 matrix is currently employed in worldwide versions of the game. The board is purposely smaller (has fewer tile positions) than Scrabble to encourage and even force the stacking up of letters upon letters. It does not have special squares such as "triple word scores" and "double letter scores" that require additional scoring calculations. In the early 1990s, Hasbro licensed electronic marketing rights to Microsoft, briefly making the game available electronically. Microsoft no longer has rights to Upwords. In 2013, Upwords was developed by indie software developers Lonely Star Software, under license from Hasbro. The game was released as a mobile app for iOS devices. On March 27, 2014, Lonely Star released the app for Android platform devices.